While this is most certainly the right formula. This can all seem a little easier said than done. What you’ll quickly find is that in order to gain any sort of traction, you have to scale your social media marketing efforts considerably. Yet, some days finding time to create five, two or even one posts that generate really good “engagement” post seems impossible. So while it’s best to share your own content (here’s how to create blogs that are exceptional), sometimes it works well to supplement your blogs with content from your peers or heroes. Think of these people as voiceboxes for your bigger brand. It takes a little pressure off of having to create everything new yourself. Marketing your business is crucial, but there are only 24 hours in a day. Where would you possibly find another hour or two each day to squeeze in your marketing? Well, we have some good news for you. The forecast looks good for you to achieve your social media marketing goals and benchmarks after all. Because just like everything else on the internet there are social media management tools available to help you. In this article, we’re going to take a look at a few of the best ones to help you level up your social media marketing game and make your social media marketing light years faster. Why Should You Use Social Media Marketing Tools? Social media marketing has become a force to be reckoned with. In the years since its inception, their purpose had changed and their reach has grown exponentially. Traditional advertising may not always be a viable option for small businesses. And the cost-effective nature of social media marketing makes it an outstanding pinch hitter. Social media marketing tools allow you to compost so to speak. Ideally, you do the planning upfront leaving you free later (think days and weeks) to do everything else on your to-do list. The important thing to keep in mind when using social media marketing tools is that you will have to invest time upfront to reap the benefits of automation. Let’s take a look at a few of the best social media marketing tools available to you. Buffer is a social media scheduling program. When it comes to social media marketing Buffer is kind of a household name. With Buffer, you can link all of your social media accounts, and create and schedule posts which will then be uploaded automatically. And the less time you have to spend on your marketing, the more time you will have to create content, write and attend to the other responsibilities of your business. The great thing about buffer is that it has an analytics page. Perusing through your analytics page will show you how well your post did or didn’t do. This allows you to figure out what works, what didn’t work. More importantly, you can measure your results adjust accordingly. Buffer allows you to see your social media analytics for the past 30 days. Your analytics page will show you things like your most popular post and your least popular post. A closer inspection will give you in-depth analysis, here you can see your numbers of retweets, liked and mentions. 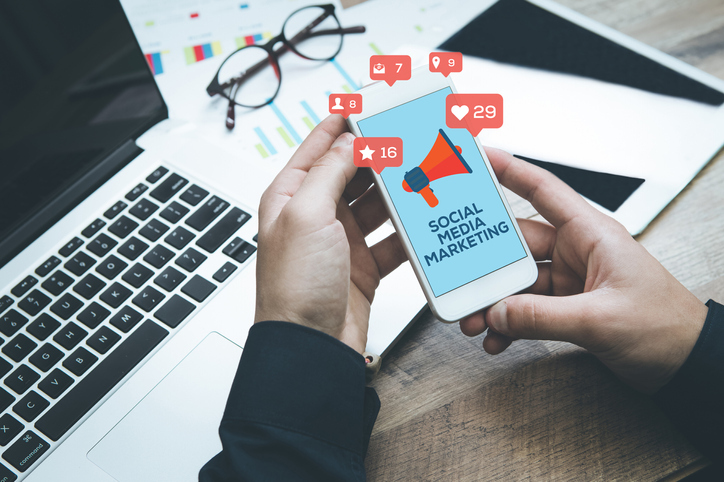 Sprout social is a social media marketing platform that allows you to schedule your social media posts and subsequently track your campaign’s performance. Sprout social can also help you identify trends and your best performing content allowing you to optimize your social content in the future. Additionally, sprout social allows you to track your performance across multiple platforms. Sprout social even features a listening platform. This feature shows you how your audience uses your platform of choice, be it Facebook, Twitter, etc. It seems that out of all the social media marketing platforms, Hootsuite has been around the longest (2008). And it’s one of the easiest social media marketing tools to use. Hootsuite allows for content curation, advanced scheduling, and it provides analytics to let you know how your content is performing. With Hootsuite, you can manage multiple social media accounts on one dashboard. When it comes to social media marketing consistency is key. In this case, Hootsuite proves to be a wonderful tool as it allows you to schedule hundreds of posts at one time. This ensures that your content consistently appears in the newsfeeds of your audience. As far as social media marketing goes, eClincher is pretty comprehensive but don’t let that scare you. It’s still pretty user-friendly. Like Hootsuite, eClincher allows you to schedule hundreds of posts at one time, even spanning months ahead (if you choose). With eClincher you have to the ability to recycle content or publish it once and remove it from the queue. eClincher also has social listening and monitoring tools which can help you monitor when others mention you and it allows for better interaction with your followers. Once you get into the thick of things eClincher offers more advanced options such as visual calendars, free images, link shortening, and video publishing support. Edgar works much the same way as Buffer, with one notable exception. Edgar allows you to add your library of content, but unlike Buffer, that content is scheduled for you. Edgar begins by its process by sorting all of your content into categories. Once sorted, Edgar adds time slots to each category. The program then fills those slots in with your content and publishes it for you. Essentially, you load your content and Meet Edgar schedules it for you. Meet Edgar also recycles your old posts and updates. In this case, once Edgar has gone through your queue of scheduled content, it comes back around and recycles older content. As you start to dig deeper into social media marketing you may find that it can be extremely time-consuming. Managing multiple social media accounts and effectively running a business, particularly a service-based business can be a recipe for disaster, not to mention quick burnout. Making use of some of the social media marketing tools available to you can make a world of difference and alleviate a lot of stress. Many of the tools mentioned here are available with free trials. Once you’ve had a chance to dig in, use each platform, and you find one you like, there are tiered plans available for purchase. And really, when you look at the big picture, the fees you may pay for social media marketing tools like the ones we discussed here are nominal when compared to traditional advertising. Social media marketing tools can help you to schedule posts, analyze and measure results. These tools can help you to quickly identify what works and what doesn’t. In the fast-paced world of marketing analytics like this can easily make or break a business. The key here is to do your research and choose the tools that would be best suited to your needs and your digital acumen. Try them out and then decide for yourself which tools offer the greatest levels of support, ease-of-use, and flexibility for how you want to interface with the social channels of your choice. And one last note, pay attention to the terms when you register. Most are annual contracts and offer discounts if you sign up for the year at one time. That can definitely save you money in the long run, but, you want to be sure you have the right tool. That’s where the free trials come in. Take advantage of those so you know what you’re getting into. Need help, remember we’re here to support you. Send us a confidential email and we can schedule a call to explore what you need (social media strategy, content or blogging support, or SEO assistance) to grow your small business in the direction you want it to go.